Help The Kile's World Foundation celebrate their first anniversary by participating in our Birthday 5K! Come out and run or walk with us! 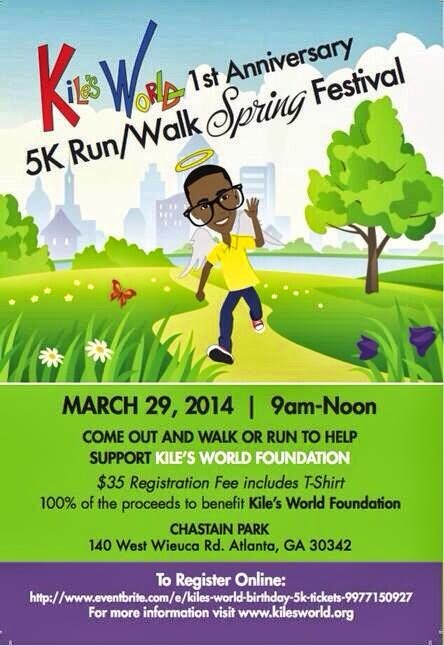 Join the Kiles World 5k March 29th Chastain Park Atlanta! Help The Kile's World Foundation celebrate their first anniversary by participating in their Birthday 5K! Come out and run or walk with us! During and after the race there will be all sorts of family friendly activities. Did somebody say jumpers?! Kangazoom will be providing all of the bouncy fun! And don't worry, there will be plenty of vendors to supply you with a sugar rush to keep up with all of the activities! This is a celebration that you don't want to miss!